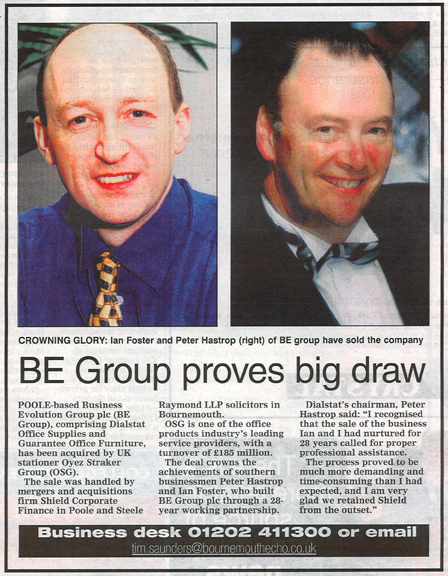 Business Evolution Group plc (BE Group), comprising Dialstat Office Supplies and Guarantee Office Furniture, has been acquired by UK stationery giant OSG (OyezStraker Group), in a company sale handled by M&A firm Shield Corporate Finance, who have UK offices in London and Poole, and Steele Raymond LLP solicitors, of Bournemouth. OSG is one of the office products industry's leading service providers, with a turnover of £185 million. BE Group's offering will be enhanced in terms of product range, value and service through OSG's backing, with this deal ensuring the continuity of a long established regional business. Dialstat's Chairman, Peter Hastrop, said "I recognised that the sale of the business Ian and I had nurtured for 28 years called for proper professional assistance. The process of selling a business proved to be much more demanding and time-consuming than I had expected, and I am very glad we retained Shield from the outset. David Young and Ed Hunter Smart guided us through the maze of preparations needed to sustain a competitive process. Their experience of all the potential pitfalls proved invaluable - we just wouldn't have got the result we did without Shield's tenacity and hard work." Shield's Ed Hunter Smart said, "This is a good result for all concerned, OSG have acquired a great business, complete with a highly experienced and energetic Managing Director and team to take the business forward, and the Chairman has achieved the exit that he sought." Shield's David Young said, "It was a privilege to be entrusted by the owners with the sale of their life's work. This is a win/win result which will allow the selling Chairman to retire from the business, the selling MD to step up in the new organisation and the acquirors to strengthen their national business by enhancing the offering to BE Group's customer base." The transaction enables Peter Hastrop to focus on his other business interests and Ian Foster to continue in his MD role, working to ensure that the fruits of cooperation with OSG are reaped by all concerned. Shield Corporate Finance provides a unique combination of corporate finance and consultancy support, all designed to maximise value achieved when shareholders exit. Shield differentiates itself through its dedication to the pursuit of remarkable results for those selling a business. Shield was founded by David Young in 2001, David is a former Head of Sell-Side M&A, Europe at JPMorgan.